The Putin Interview: Does Oliver Stone Have a Weak Spot for Dictators? In Salem, Massachusetts in 1692, Susanna Martin was executed for being a witch. The evidence against her was compelling and irrefutable. In capital cases like this, testimony by at least two eyewitnesses was required to convict. One man testified that in 1660 he had seen Ms. Martin bewitch a horse. Another testified that she had broken uninvited into his dreams 20 years later. The judges ruled that this constituted two eyewitnesses to the same crime because witchcraft was a “habitual” crime. She was hanged on July 19. 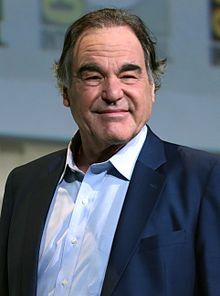 By similar logic and equally “solid” evidence, Joel Sucher, in a piece titled “Has Oliver Stone Ever Met a Dictator He Doesn’t Admire?” published in the Observer in January accuses Oliver of despotophilia, which Joel too identifies as a “habitual” crime. Joel thinks he knows Oliver. He made a highly laudatory documentary about Oliver in the early 1990s when, he recalls, “Oliver was an aw’ shucks, pot-smoking, break your balls, tweak your chain, say outrageous things” kind of guy. But he and Oliver have had little if any relationship since. I, myself, have been close friends with Oliver for more than 20 years. Oliver and I co-authored The Untold History of the United States documentary film series and New York Times bestselling book between 2008 and 2013 and have been writing articles together and doing screenings and lectures around the world for the past four years. In his article, Joel describes me as a “friend and a legit American University historian, an anti-nuclear activist.” Joel has been trying to reach Oliver through me for years, but Oliver spurned all his requests, telling me he didn’t “trust” Joel. Perhaps this is Joel’s attempt at payback. It is not serious analysis. To me, the Oliver who Joel describes is completely and utterly unrecognizable. The man who loves despots doesn’t exist except in Joel’s mind. But the methodology Joel employs to discredit Oliver is precisely the same one used over and over again by conservative hacks who are out to do a hatchet job. It anticipated the assault on Oliver that has begun in an effort to preemptively discredit his forthcoming series of interviews with Vladimir Putin that air June 12-15 on Showtime. Joel is not a conservative hack. Why he would want to emulate those he once despised baffles me. Oliver is one of Hollywood’s most recognizable and talented directors. He has won several Academy Awards and would have won more if it had not been for his outspoken, controversial, and often radical stands on topics such as the U.S. invasion of Vietnam; the CIA death squads, covert wars, and toppling of popular governments in Central America and South America; the sinister forces who may have been behind the Kennedy assassination; the Wall Street looting of the American economy; the odious presidencies of Richard Nixon and George W. Bush; the revelations by and persecution of NSA whistleblower Edward Snowden; the nuclear arms race and its threat to all life on our planet; America’s far-flung empire of bases; the corrosive effects of U.S. militarism on a global scale; the overreach of the national security state; and a host of other issues. He is not only a brilliant filmmaker; he is a provocateur. Over the course of the past 40 years, he has said and done his share of outrageous things. Those who recognize his artistry but disdain his politics cherry pick from the same tired litany of examples to paint the portrait of an apocryphal Oliver Stone. Their purpose is not to understand Oliver but to demean him. That’s too bad because Oliver plays a unique and essential role in American public life. He is one of a tiny handful of Hollywood artists who cares enough about his country to say the things that need to be said, offering a serious critique of the United States and its role in the world. He doesn’t do it out of hatred of the United States. He does it out of a sincere patriotism—the same patriotism that motivated him to drop out of Yale and volunteer for combat in Vietnam, where he was twice wounded and highly decorated. Disillusionment with that war began his process of lifelong exploration and led to his deep-seated belief that America can and should live up to its highest ideals. Having worked as closely with Oliver as I have, I can say categorically that he is no lover of despots. He admires those who speak truth to power—people like the young William Jennings Bryan, FDR, Henry Wallace, JFK, and Martin Luther King. To suggest, as Joel does, that Oliver admired the enormously popular and four times democratically elected Hugo Chavez for his authoritarian tendencies rather than because he dramatically reduced Venezuelan poverty, sparked a populist upsurge throughout Latin America, and defied those business, State Department, and CIA interests which tried to oust him, is complete nonsense. To think that Oliver would want to interview Fidel Castro because he admired his despotic tendencies rather than because he was a charismatic, larger-than-life figure who stood up to the United States, and, despite his flaws, inspired revolutionaries around the world for decades is equally meretricious. To suggest that Oliver’s decision to interview Vladimir Putin for a forthcoming series of interviews came from some desire to lionize the Russian leader is also hogwash. Oliver interviewed Putin long before this current brouhaha over the Russian intervention into the U.S. presidential elections. Oliver saw that tensions between the U.S. and Russia over Syria, Ukraine, and the Baltics were driving our two nations closer toward war than at any time since the Cuban Missile Crisis in 1962. He had already lived through a war about which American leaders lied shamelessly and one in which neither they nor the American people had any understanding of who our Vietnamese adversaries were and what motivated them. Watching the demonization of Putin in the American media and the simplistic rendering of Russian aggression and future expansionist plans, he didn’t want to see this happen again. And with the U.S. and Russia possessing thousands of nuclear weapons, hundreds of which are pointed at each other on hair-trigger alert, a military confrontation between the world’s two military superpowers could have consequences too frightening to contemplate. For Joel to suggest that Oliver was intending to whitewash and sanctify Putin rather than try to understand him and prevent a cataclysmic catastrophe is again simply unconscionable. Joel’s discussion of The Untold History of the United States is another disingenuous attempt to distort the record in order to put Oliver in the worst possible light. He begins by referencing the Television Critics Association press conference at which some reporters deliberately twisted Oliver’s remarks to suggest that we were going to exonerate Hitler. Oliver, contrary to Joel’s assertion, never said that Hitler was “misunderstood” or that we were going to treat him sympathetically. Oliver was saying that fascism, as the most vile of historical movements, is not sufficiently well understood in the United States and that those who treat Hitler as a case of individual pathology rather than as a complex historical phenomenon are dangerously misinformed. In Untold History, Oliver and I deplore anti-Semitism and reveal the fraudulence of The Protocols of the Elders of Zion. Oliver is half Jewish. Most of my relatives were killed in the Holocaust. To imply that Oliver is anti-Semitic is beyond absurd. What Oliver was referring to and what we do reveal is U.S. businessmen’s much deeper and longer involvement with Nazi Germany than most Americans realize. To say, as Joel does, that Untold History met with “mixed reviews” might be technically correct, but it is highly misleading. That the New York Times and New York Review of Books would take issue with a book and documentary series that critically explore the history of the American empire and national security state is not a surprise. It certainly shouldn’t be a surprise to Joel, who describes himself as having been a “left-wing anarchist” in his younger days. Nor should the fact that right wingers would share that assessment. If Joel were being more honest, he would have mentioned that the overwhelming majority of reviews were not only positive but effusive. And to have to dig down to Boise, Idaho to find a reviewer who makes fun of Oliver’s narration shows how desperate Joel was to cast aspersions on anything Oliver touches. Perhaps Joel’s radical days are long past and, in the words of Phil Ochs, he has “grown older and wiser and that’s why he’s turning [us] in,” but I would have thought he might cite instead the effusive encomiums for Untold History from Mikhail Gorbachev, Bill Maher, Dan Ellsberg, and Katrina vanden Heuvel, or from the dozens of historians who have sung its praises, or from Pulitzer Prize-winner Martin Sherwin who called Untold History “the most important historical narrative of this century,” or from the Nobel nominated antiwar activist David Swanson, who called it “phenomenally great.” I was similarly taken aback by Joel’s deep and presumably newfound trust of the CIA and his disbelief in the fact that the CIA might have attempted to overthrow a left-wing Latin American leader, which, we know, has only occurred dozens of times. I could but won’t go through the entire bill of particulars that Joel levels at Oliver. Suffice it to say that, whatever his motives, Joel is trying to tarnish the reputation of one of the very few Hollywood filmmakers who refuses to be cowed by the establishment into making movies that lull the population into conformist somnambulance rather than ones that make viewers think critically and want to change the world. Oliver’s supposed “love” of dictators is simply a figment of Joel’s fertile imagination. But, just to be safe, I’ll be sure to tell Oliver to stop bewitching horses and breaking into Joel’s dreams.